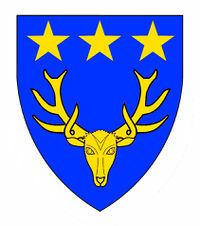 Azure, a stag's head cabossed and in chief three mullets Or. I am Lord Alexander Clarke and I reside in the Shire of Hadchester. I have been involved in the SCA since 2002 where I first started attending heavy list practices in Malagentia. After graduating college I moved back to my home town and was instrumental in the formation of what is now the Shire of Hadchester, serving as its first Senechal from 2008 to 2010. I am a member of two households, The Priory of St Colin the Dude, and also a squire to Syr Cedric of Thanet. The year is 1415, I patiently await news of King Henry the V's victory against the French forces at Agincourt. I have made a comfortable home here in Calais the past 5 years, with my wife and soon to be child. Our small farm on the outskirts of town supports us, and what I earn being in service as a Man-at-Arms on the city watch keeps us warm in the winters. I am squire to the noble Knight Syr Cedric of Thanet, and am welcomed as a member of his household. His kindness and guidance help me find my way on the path of Chivalry. Deed Coordinator- GNEW 2013 to Present. Champion of the Deed of Arms, GNEW 32. Bearer of the Original Shield of Chivalry (Deed Shield) in perpetuity. Organizer of "The Viking Deed," GNEW 32. 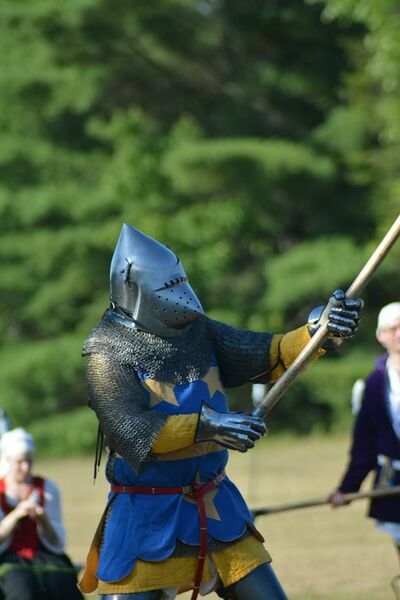 Outside of the SCA, Alexander runs an Educational Lecture and Presentation service called The Agincourt Soldier. 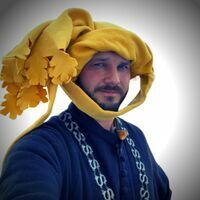 This service is dedicated to brining high fidelity, accurate, informative and engaging presentations about the Lancastrian Era of the Hundred Years War to schools, libraries and other civic organizations. This page was last edited on 26 February 2019, at 03:41.